Seven Oak Bed and Breakfast is a mile from the city limits and away from the bustle of downtown Hood River. The neighborhood is scattered light industrial and the homesite is surrounded by mature Douglas Fir trees creating a country garden oasis. Nearby is the majestic Columbia River Gorge, with renowned wind sports, hiking, wineries, micro and cider breweries, mountain biking, skiing, golfing, kayaking, SUPing, a very good pumptrack, and more. Truly a Northwest Playground!! 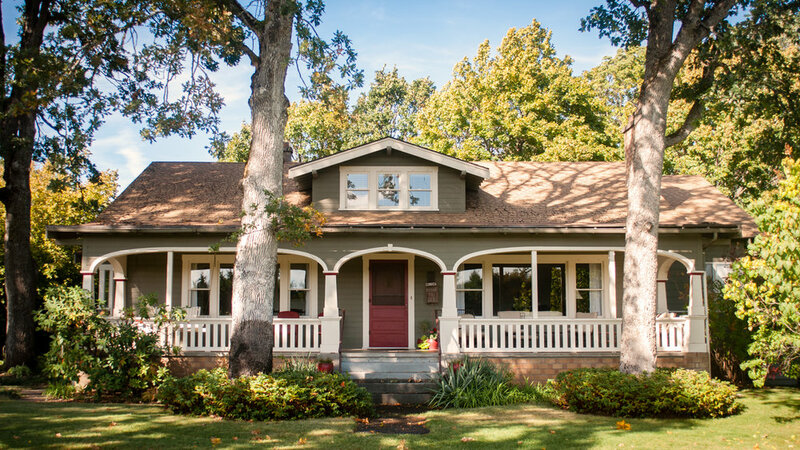 This 1928 3500 sq ft Craftsman Bungalow home is simply elegant and offers guests a relaxing and wholesome stay. Beautiful hardwood floors, lots of natural light, and little clutter add to the ambience and are reminders to settle down and enjoy your stay. The house is sited on two acres with well-cared gardens and lawn and has plenty of nooks for lounging opportunities and outdoor fun. A spacious dining room with coffee and tea bar and a living room with ample seating provide a beautiful view of Mt. Hood. It's not uncommon to see quail or pheasant walking through the grounds during meal time. The front porch is the place to sit and watch the mountain or read a book or just take a nap. This place will slow you down. One queen and one single bedroom are on the main floor, along with a full hall bathroom and an additional sitting room. A great place for a cup of coffee and the morning sunshine. Upstairs are two queen bedrooms plus a room with two single beds along with a full hall bathroom. When you reserve a room upstairs or downstairs, the bathroom is private for your use. We do provide quality bed and bath linens, bathrobes, hair dryers, soaps, shampoo and conditioner. The 242 sq ft Seven Oaks Cottage is away from the house next to the vegetable garden. It has a queen bed, kitchen and bathroom. There is ample parking, room for storage of your recreational equipment and a hose for bike washing. Seven Oaks Bed and Breakfast welcomes you to stay and see the Gorge!